If you have installed magento under a subfolder of the www root folder for an example “store” you should add this directory name before the index.php. When you review the options available for a new discount the first thing is the type of the discount amount calculation and this is the one you should select first. 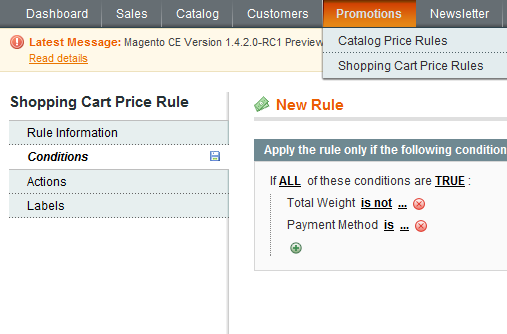 The next thing is the rule set which should match in order for the discount to be applied. You should test any such discounts first before releasing them for a live store in order to prevent any losses from incorrect calculation or rules set. Here Magento Premium Promotion Discount Rule Extension provides flexible pricing rules - An efficient creator of a variety of promotions, helps in increasing conversion rates. I like you topic about Manage promotion and coupon easy in Magento and always love to know about new things, thank for kind help. Coupons codes can be associated with shopping cart price rules to apply a discount when a set of conditions is met. For example, a coupon code can be created for a specific customer group, or for anyone who makes a purchase over a certain amount. To apply the coupon to a purchase, the customer can enter the coupon code from the shopping cart page, or possibly at the cash register of your “brick and mortar” store. Sign in to your Reseller Control Center. For Promo code, enter the name of the code. For Description, enter a depiction of the promotion code for your reference. For Discount, select Amount or Percent, and after that enter a number for the markdown sum you need to offer.